The physical mechanism of absorption is the conversion of sound energy to heat. This generally involves a light density material. Acoustically, materials are described by their absorption coefficient which ranges between 0 (totally reflective) and 1 (totally absorptive). In the field of noise control it is a question of how much noise is not absorbed – the proportion that is reflected. (A materials reflection coefficient and absorption coefficient add up to 1). Carpet, for example, has an absorption coefficient of 0.50 (at 500 Hz) and only reduces the incident sound by 3 dB, which is only just perceptible. By contrast, a material with an absorption coefficient of 0.90 (such as acoustic slab) reduces the incident sound by 10dB which is then perceived by the listener as half as loud. A material’s absorption properties are frequency dependent; in general it is more difficult to absorb lower frequencies. It should also be noted that, control by absorption does not materially affect the exposure when the listener is positioned between the noise source and the absorption layer. 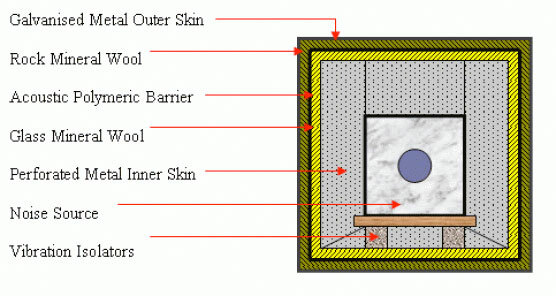 Typically in noise insulation a barrier is placed between the source and receive positions. The barrier may be partial or complete. Good isolators are generally heavy or rigid. Like absorption, the insulating property of materials is frequency dependent; in general it is harder to attenuate low frequencies. Good absorbers are generally poor isolators and vice versa. Successive layers of insulation are not directly additive. If a single layer of plasterboard provides 10 dB insulation at 250 Hz then two layers do not provide 20 dB: in fact the result is closer to 12 dB. For two structures to be strictly additive a significant space or space layer is required between them. The actual insulation provided is often limited by either flanking transmission or leakage. Even small gaps or leakage paths can severely degrade the performance of a partition. With partial partitions, such as non-continuous barriers, the effects are dominated by the height of the barrier and the distance of the sound source and receive points from the barrier. Absorption is far less effective than insulation as a means of noise control. Also, good absorbers are generally poor insulators and visa versa. Acoustic absorption for example will do little to improve the insulating property of a wall or partition. However, it can be used to good effect to improve listening conditions in spaces and is an effective means of controlling reverberation time, hence reverberant sound levels in a space. A prime example of this is fast-food establishments that tend to employ hard, easy to clean, surfaces, which also tend to be extremely noisy. A similar effect may be observed in some manufacturing process spaces, which have much the same requirements. Noise control is a diverse science and is generally taken on a case-by-case basis. In most industrial applications where total containment is not possible because access is required, a combination of absorption and insulation is used. When partial containment is employed the performance of the structure is more a matter of the degree of containment rather than the actual materials employed. Therefore, even a lightweight barrier can provide a useful degree of screening from a piece of machinery, without materially affecting access to the equipment. To comprehend the rudiments of noise control, it is necessary to have a basic understanding of the nature and size of sound. Sound is comprised of pressure waves: its amplitude is measured in decibels (dB) and its content and nature is expressed as its frequency. Most adults enjoy an audio frequency range of around 40 Hz to 15 kHz. Our hearing, however, is not equally sensitive to all frequencies. At modest sound levels the ears response can be plotted as a curve. This is applied as a weighting curve to some sound level measurements, which is known as an A-weighted sound level dB (A). Consequently dB (A) is an approximation to our hearing. In terms of amplitude our hearing has a range from around 0dB (known as the threshold of hearing) to 140dB (the threshold of pain). A noisy factory is typically in the range 90 – 100 dB (A), while a pneumatic drill registers 120dB (A). The decibel scale is a logarithmic scale and as such is not subject to the normal rules of addition and subtraction. For example, two noise sources of 50dB (A) thankfully do not combine to give 100 dB (A). In fact the result is 53 dB (A): a difference of 3 dB is only just perceptible. In terms of a subjective impression to compare loudness, an increase of 10 dB is roughly equivalent to twice as loud. The decibel scale and loudness should be borne in mind when considering noise control. A logarithmic measure of the ratio of sound levels, as used in describing levels of sound pressure or sound power, usually related to a reference level. The bending of sound waves around an obstacle or barrier. The number of cycles per second measured in units of Hertz. A frequency of 1000 Hz means 1000 cycles per second. The equivalent steady level that would produce the same A-weighted sound energy over a stated period of time as varying sound level over that period. The ratio of the sound energy absorbed by a material to the energy incident upon it. The sound reduction index of a structure is the insulation value of that structure expressed in decibels. The amount of sound absorption provided by a product or system, equal to its sound absorption coefficient times its surface area, measured in sabins. To define a noise problem, the noise source must be identified. The noise level and its frequency spectrum at the point where control is required must be measured. All noise transmission paths between sources and control point must also be clearly identified. Accurate identification of the source can occasionally be difficult. In cases of doubt, the true source can usually be identified either by successive removal of alternatives or by “fingerprinting” using a detailed frequency analysis. The level at the control point must be measured in accordance with the relevant Standard, e.g. to produce a Leq value for assessment of hearing risk. The frequency spectrum must be measured since the performance of most noise control treatments depends heavily upon frequency. The transmission paths between source and control point must be identified. Failure to control a single major path will seriously impair the value of any treatment. It should be noted that paths may be airborne or structure-borne or both, and direct or indirect such as reflections from room boundaries. The noise reduction required is the difference between the level measured at the control point, and that defined as acceptable by the relevant Standard or Code of Practice. The reduction should be specified at all frequencies to provide sufficient control system design information. As a general guide, reductions of 5-10 dB(A) are usually readily achievable, whilst reductions of 10-20 dB(A) often require extensive treatment. Generally, high frequency noises are more easily controlled than low frequency noises. Where reductions exceeding 20 dB(A) are involved it is probable that professional advice would be needed. e.g. change of process, relocation of noise source, modification of components. e.g. use of ear defenders, relocation of operative. e.g. enclosure, screens, ceiling treatment, wall treatment, floor treatment. Although Source and Receiver Control must always be investigated, many noise problems are solved by Path Control. Reflection utilises acoustically opaque barriers to reflect noise away from the control point. Systems may range from partial height screens to complete enclosures, depending on the scale of the problem. Reflection alone provides little actual dissipation of noise energy. This can be most effectively achieved by use of absorption techniques. Absorption normally entails the conversion of noise into thermal energy. It is usually achieved by friction losses of sound waves passing into materials containing networks of narrow internal passages such as Glass, Rock and Foam. For maximum effectiveness, careful physical design of the material is essential. The sound absorption performance of a material is defined by its absorption coefficient. Performance should always be presented as a function of frequency, and in terms of the thickness of the material. Whilst open cell materials have good sound absorption characteristics at all frequencies, the inclusion of an airspace between the insulation and the surrounding structure will usually improve performance at the lower end of the frequency range. The performance of reflecting surfaces as sound barriers is expressed as a Sound Reduction Index (SRI) or Transmission Loss. (The difference in acoustic energy on either side of the material, measured in dB). It is common practice to express the overall performance using single value, usually the average SRI over the frequency range 100-3150 Hz. The SRI expresses the maximum attainable performance under ideal conditions. In practice this can be reduced, sometimes considerably, by “flanking transmission” and other effects. When approaching a noise control problem, the difference between sound insulation and sound absorption should be appreciated. Refers to the attenuation of reverberant noise within the same room or area as the noise source. This normally involves lining all or part of the walls, floor, roof or ceiling of a building with a material which absorbs sound. Sound insulation is concerned with preventing noise being transmitted from one area into another, for example by erecting a partition or wall. The ability of a partition or wall to resist the flow of sound energy through it is largely determined by its mass. However, here again sound absorbing materials can have an important role to play. It can be shown that doubling the mass of a partition/wall will normally reduce the sound transmission through it by one quarter, or in decibel terms 6dB. (In practice it is more realistic to claim a 5dB improvement for each doubling of mass.) This rule of thumb is known as the “mass law” and is useful in providing a guide to the improvement that can be achieved by increasing mass. However, in many instances significant improvement can be made by the addition of efficient Acoustic Insulation products to the construction. A complete acoustic enclosure can provide noise reduction of 20 dB(A) or more. An enclosure can be used to surround either the noise source or the person exposed to it. The walls and roof should be formed from a material having a SRI exceeding the noise reduction required by at least 5 dB at all frequencies involved. To prevent build up of reverberant noise within the enclosure an internal lining of absorptive materials should be used – usually a minimum thickness of 50mm. Direct vibration contact between enclosure and machine should be avoided by using flexible couplings and seals. Small air-gaps can seriously detract from the enclosure’s acoustic performance. Care is required when introducing services such as cooling air, power, fuel or water to an enclosure, in order to ensure its overall performance is not affected. For all complete enclosures, attention to detail is vital to avoid weak points. Doors must be fitted with flexible seals and spring closures or compression latches. Windows must be constructed to provide the same SRI as the remainder of the structure and consideration should be given to the use of multiple glazing. In many cases a complete enclosure is not practicable, and a partial enclosure may be necessary. In this case a lower Sound Reduction Index is provided. The SRI becomes less important than the provision of an effective sound absorbing lining. The fundamental design principle requires avoidance of direct sight lines between source and receiver. In some cases, a simple screen may provide sufficient noise control, although in general screens have very localised effects. A screen will reflect noise and if lined with an absorptive material, will provide some further reduction in the energy. As in the case of partial enclosures, the screen may be constructed of a relatively lightweight material, since the SRI required is not high. Noise can diffract around obstacles and for maximum effectiveness, the screen should be as large as possible and placed as close as possible to either source or receiver. Screens should be both mobile and decorative. Many noise problems result from the reverberant build up of noise within an acoustically “hard” building. Reductions of the order of 4 dB(A) in reverberant noise levels can often be achieved by the use of absorptive ceiling and/or wall treatments. The products that should be specified in these applications will depend to a large extent on building type, i.e. industrial, commercial, etc. In factories, Tap Quietair Baffles, see TAP Spec guide, suspended from the roof or ceiling, effectively reduce reverberant noise. In offices or commercial buildings where aesthetics are of importance, reductions in reverberant noise levels can be achieved by installing a suspended ceiling incorporating Taptiles and/or Tap Quietwall panels, see TAP Spec guide. Floors may be improved by the use of Iso-barrier, see TAP Spec guide. The reduction in noise level depends on a number of factors, but in general, for each doubling of effective absorbing area (or Sabin) in a room (effective area or Sabin = area of absorber x absorption coefficient) a reduction of 3 dB(A) in the reverberant noise level may be expected. It must be emphasised that this technique provides no reduction in the direct noise transmission path and therefore accurate identification of these is essential. The effectiveness of enclosures, screens and room treatment has been discussed in isolation. However it may be necessary to use a combination of two out of three or all three methods to obtain the correct noise control, e.g. Tap Laminate, see TAP Spec guide. Many cases occur where existing partitions are acoustically inadequate. In such cases it is usually possible to achieve improvement by: Stopping flanking transmission, e.g. by sealing all gaps; providing a cavity lining of Taptiles; or adding a secondary partition, separated from the original wall, again by installing Taptiles within the cavity. A suitable external treatment is an application of Tap-wrap. Where sound absorption in air conditioning equipment and distribution ductwork is required, acoustic foam or melamine should be used.